We are growing Pima cotton, almonds, and wheat this year on our farm in Fresno County. This is a repeat, but I think it is worth a repeat. We have been all thinking and praying a lot this past week. Many of us think we have lost our way. Can you imagine the heroes in John Wayne movies if they saw what is happening in the country today? My hat’s off to those of you who still have that can do, pioneer spirit. This country was built, at least in the West, by those who faced enormous problems and made a go of it. Can you imagine a John Wayne character going to the government after problems with a cattle drive? Yes, I know life isn’t like a movie. Got it. That’s just an illustration. What I want to commend is the pioneer, ‘can do’ spirit that built this country. Yes, I understand all the criticisms of Manifest Destiny, etc. I am not addressing that. I am saying there is an enormous, qualitative difference between the people who built this country and us today. In that comparison I’m not sure we look all that good. The immigrants who came to this country in the 19th Century faced tremendous hurdles just getting here. Can you imagine putting all your worldly belongings on a boat and sailing for nine weeks just to cross the Atlantic? That was only the beginning of the trip. Then they had to load up and start walking across the country. I’m tired thinking about it. I think we still need some of that pioneer spirit to solve the problems we face today. Recently I talked about the Pioneer Spirit. The contrast is today’s response—one minor hiccup and people are suing each other or running with their hands out for government help. John Stossel criticizes himself and the government. Being a famous and rich reporter he has a beach front home that has been damaged twice by hurricanes. Each time the government---that means you and me---have helped him rebuild his beach front, luxury, second home. This is crazy. Even Stossel admits this is crazy. I get it. We are not a society of lone rangers. We live in community. Our high-tech world is more complex and inter-dependent than the world of the 19 Century. But, I think that calls for more, not less, of the pioneer spirit that made this country great. The world makes fun of Americans being a bunch of cowboys. People vote with their feet. Have you noticed where people all over the world are migrating to? They are not migrating to China or Cuba. People all over the world want to come to the U. S., not because it is like home, but because it is different. Today’s immigrants still see the U. S. as the land of opportunity. As you can see my supervisor is out making sure I do a good job pulling petiole samples. We almost have the cotton laid by. Then we can park the tractors for now. It’s actually a pretty simple formula. Where does your money come from? Taxes. Where do taxes come from? A healthy economy. When businesses are making a profit and people are making money they pay taxes. So, if you want money for your social programs and environmental programs why don’t you help the economy by more productive? That way there will be more money coming in the form of taxes instead of crushing producers by doing things like cutting off surface water to farmers and piling on needless regulations. There is time and a place for government oversight. That issue was settled during the administration of Andrew Jackson in the 1830’s. No one is seriously saying no regulations. But, this has been getting out of hand for a long time now. A friend of mine is doing what everyone wants. He and his wife are growing organic fruits and vegetables. She takes their kids around to the local farmers markets. Daniel was ready to quit five years ago because he was spending five hours a week doing paper work to certify his crops. Now he has had to hire someone who spends twenty five to thirty hours a week filling out forms. We should be pinning a medal on Daniel’s chest, not stretching him to the breaking point. Why Are We Losing Jobs Overseas? There is a lot of hand wringing and finger pointing about the loss of manufacturing jobs. The Left says business is going after cheap labor, and that is true. None of us want to pay more for anything than we have to, that’s human nature. Businesses complain about the cost of regulations, and that too is true. Years ago Bob Stallman, then President of the American Farm Bureau Federation said it was costing American farmers $20 Billion dollars a year to comply with government regulations. No matter how you slice it that is a lot of money. I know a family here that built a business enterprise here in Fresno at the same time they built an identical project in Phoenix. The one in California cost 25% more than the one in Arizona just because of the regulatory costs. The family’s conclusion? We will never build anything in California again. No matter how well intentioned, no matter how good an idea- every new tax, fee or regulation makes it harder for a business to survive. Every new tax, fee or regulation makes going somewhere else more attractive. Look at the story of Tesla’s battery plant. Tesla is a California company doing what we all want, creating a new electric car industry. And the government of the State of California pushed their new electric car battery plant out of the state. Tesla didn’t leave because of lower wages. Tesla left because of over regulation. I know there is more to life than making a buck, but if you can’t make the bucks the rest of the equation falls apart doesn’t it? Yes, we all want clean air and clean water. We all want high paying jobs. But, there is also reality and reality can be a real…bear. All of my crop prices are down this year. Two years ago I sold Pima cotton for $1.80 a pound. This year it is $1.27. That is not nearly as much fun. Last year wheat went for $300/ ton. This year it is $195/ ton. Last Fall almonds were $4/pound. This year they are just over $2. That is the reality I have to deal with. How does the government respond? More regulations. More taxes and fees. This past winter I had to attend a five hour class to self report my fertilizer use to the state. Seriously? The IRS lets me self-report my taxes without any required class. Do you want to know the funny part? The people who mandated the meeting were surprised I objected to going to a five hour meeting. They thought it was perfectly normal. Maybe for them it is, but I don’t make my living by going to meetings. I make my living by growing food and fiber for a hungry world. And now we are back to that healthy economy thing. Dear Sacramento and Washington- You are doing it wrong. I get it, we have problems to solve. We have done a lot to clean up the air, but we still have a ways to go. Poverty is too high in our area. But, we are not going to solve these problems by slicing the pie smaller and smaller. We need to make the pie bigger. If you want more taxes for your programs stop strangling businesses, help us create a healthy economy. Which is our biggest problem? Climate Change? Or, the Delta Smelt? My fellow farmers and I can lower the carbon footprint for 38 million Californians by growing their food locally. But, we will need some water to do that. If not, you are going to have import boatloads of food every day to feed our people. What’s that going to do to your carbon footprint? Look down the road- where will our food be coming from five or ten years from now? We will have more people and fewer farms. When is that ever a good equation? The basic formula, according to the UN Food and Agriculture Organization, is that it takes 800 gallons of water per person per day to produce their food. Multiply that number by 38 million Californians and you need 31 million acre feet of water per year to feed California. You know what is interesting? That is basically how much irrigation water California has used for the past few decades. You can wiggle and squirm, fuss and fume all you want about farmers and water, but that is the basic number. It takes 31 million acre feet of water to produce food for California. Even if you import our food it wills till take that much water and now you are adding the carbon foot print of cargo ships chugging bunk fuel back and forth across the ocean. For those who say ‘both’, that you want to protect the smelt and lower our carbon foot print the ball is in your court. Show us how. The thesis of my book Ten Reasons: Finding Balance on Environmental Issues is that we need a healthy environment and a healthy economy. Current policy leans everything against the economy and I think we can see both the economy and the environment and the economy have suffered. We have cut water to our farms for decades now and fish populations continue to decline. Again, for those who say ‘both’, that you want to protect the smelt and lower our carbon footprint the ball is in your court. Show us how. This really is not that hard. California’s farmers and farmworkers are great, hard working people. Farmers are constantly making improvements in how they manage their water supply. Tens of thousands of acres of drip systems are going in every year. But, there will never be enough drip systems to lower that number- 31 million acre feet of water to feed California. My fellow farmers and I are proud of what we do, growing food for a hungry world. We will be glad to continue growing your food, but we are going to need some help. Until the enviros decide really are serious that climate change is their number one issue and back off on water we will all suffer. They have a choice to make. Which is our biggest problem? Climate Change? Or, the Delta Smelt? Regulate Does Not Mean Micromanage! That was some weird weather yesterday. Heck, it's been a weird weather week. Does anyone remember it was 90 degrees the other day? 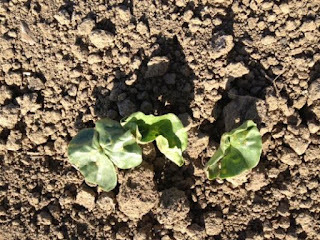 Cotton is planted and coming out of the ground. The ups and downs in the temperatures are a concern. Cotton is temperature sensitive and very susceptible to cold. Fingers crossed. Prayers offered. President Clinton famously looked silly trying to dodge a question with his answer,’ It depends what the meaning of “is” “is.” That would be a lawyer’s trick. On a much more serious note, I do not think many in the government know what the term “regulate” means and this failure is the cause of endless mischief. The Constitution does give Congress the power to “regulate commerce with foreign nations and among the several states” (Article 1 Section 8 Clause 3). Here is where I do not think today’s regulators know what “Regulate” means. Take a look at the Federalist Papers. You remember them from your Civics class. In the Federalist Papers Hamilton, Jay and Madison made their argument, point by point, for the proposed Constitution. The original Constitution only runs six to ten pages depending on your type. It’s not that long or complicated. My copy of the Federalist Papers runs over six hundred pages of fine print. They spent a lot of time discussing each point of the proposed Constitution in detail. So, what do they have to say about Article I Section 3? Madison writes on the issue in Federalist 42. For the Founders regulation was about trade! It wouldn’t be much of a unified country of they could raise import taxes against each other would it? We are supposed to be one big happy family. So, what happened? How did we get from power to regulate trade to micromanaging business today? In his “Age of Jackson” Schlesinger writes how Jax was the first President to use power of government to control a business, in his case, the Biddle’s Bank of the United States. Schlesinger’s conclusion was, “the public conscience in the form of the democratic government had to step in to prevent the business community from tearing apart society in its pursuit of profit” (510). So, for those who think business people want to go back to some wild, no regulation world, that is just not true. We have accepted the power of government to regulate in the modern sense for over 170 years. What we object to is the heavy hand of micromanagement, especially by people who have no idea what they are doing. One argument for the blizzard of new regulations is that the government is acting for the ‘common good. The result, however, is not the common good. Manufacturers are micromanaged to the point where they send their factories overseas, and then they are vilified. Apple’s fans are manically supportive. Do you realize Apple does not make anything in the US? Patagonia outdoor clothing is popular with cool people. They don’t make anything in the US either. Hollywood roots for all sorts of causes, then they make their movies overseas because it is too expensive to film here because of the regulations. Do you see the pattern? My last year as Farm Bureau President I had regulators, academics, electeds and journalists tell me repeatedly, if farmers couldn’t work under the proposed rules then we could just import our food. Really Sparky? That’s your best plan? We are strangling California’s farmers to take care of the fish and the fish keep dying off anyway. How is that the greater good? Both farmers and fish are suffering. If you want to run my ranch, it’s for sale. You buy it and you can run it any way you want. Until then, in the immortal words of Yosemite Sam, “Back off.” You really don’t know what you are doing. There are alternatives. In Japan business and the government work together to solve problems and build the economy. I have said in my book, “Ten Reasons: Finding Balance on Environmental Issues” we need a healthy economy and a healthy environment. Right now we have neither. We need to take another look what we mean by ‘regulate.’ Right now we are killing the goose that lays the golden eggs. We are crushing small businesses and family farms so all that is left is big business and then we criticize big business for pushing their production overseas. As a farmer, I expect to fight bugs, weeds and the weather. I didn’t expect having to fight my own government. Another interesting week on the farm. We got over an inch and a half of rain last night. [The forecast called for a tenth to a quarter inch. If these guys can't get the forecast for one day correct can you understand why we question their forecasts for the next century? But, I digress. It's hard to remember it was 90 degrees three days ago isn't it? How about trying to decide when to plant cotton? There are only two things I know for sure about growing cotton- if you plant it dry it will not sprout and if you plant it cold it will get sick. So, we planted a little and stopped until Monday to see if things are going to clear up. Can you see why going to Vegas holds no real interest for me? That's not gambling. It's over in a few moments. Try laying a million bucks out in the dirt for six months in the wind and weather. Now that's gambling. And all the other state and federal water managers. You all don’t seem to take water conservation very seriously- why should we? After two years of lecturing us about water conservation. Two years of brown lawns and buckets in our showers state and federal regulators have sent over 872,975 acre feet out to sea!!! That is enough water for over 1.6 million California families for a whole year!!! Since last summer you have telegraphed the drought wouldn’t be over even if we had an El Nino winter. Actually, that is what it means. Actually, that is what it means. Droughts are when it doesn’t rain. Droughts are over when it starts raining again. You all favor Australian drought management methods. I think I know why- it uses centralized government command and control. The problem is you guys are not very good at this. Why not take a lesson from the Israelis. Two years ago Prime Minister Netanyahu was in California and suggested Israel had learned some lessons about water management that could help California. From the Governor on down you gave him the cold shoulder. I have visited Israel. They have will about water. They don’t dither and do studies- they get the job done. J’accuse-You all have mismanaged our water system and we must pay for your politically correct failures. Do you want a way out? Stop thinking one dimensionally. There are wet years and there are dry years in California. We need to save the water from the wet years like this for the dry years. This isn’t going to happen if you all keep blowing water out to sea. We need a healthy economy AND a healthy environment. Please try and work on solutions with that in mind. We are at the end of our ropes here. We can’t live with too many more of your mistakes.